Our first time at Long Beach Comic Con was a good one; with reasonable expectations set, the convention seems to successfully deliver everything it sets out to. 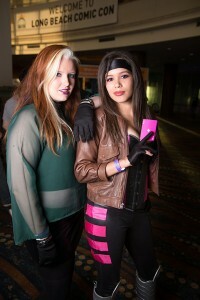 Rogue and Gambit X-Men cosplayers stop for a shot in the convention center lobby. This entry was posted in Conventions, Reviews and tagged #lbcc, #lbcc14, #lbcc2014, cosplay, long beach comic con on October 14, 2014 by CosplayMedia. This entry was posted in Photos and tagged #lbcc, #lbcc14, 2014, cosplay, long beach comic con on October 14, 2014 by CosplayMedia.